2. Is El Salvador dangerous? 3. Should I get any special shots before going to El Salvador? 4. Who will pick me up at the airport? 5. Does the cost of the package include everything needed? 6. What´s the currency in El Salvador? 7. What kind of clothes do I need? 8. What kind of food does El Salvador have? 9. Do I need a wetsuit? 10 I have not surfed before but I am eager to learn… when should I travel to El Salvador? 11. How much cash should I bring? 12. Will I be available to get in touch with my relatives back home? 13. What costs will I have on this journey? 14. The airline is charging me an additional $100 fee for each surfboard… Are there surfboards available for rent? 15. Are there sharks around in El Salvador? 16. Can we cook at the lodging facilities? 17. Can I use my credit card in La Libertad and the east side to pay for meals and stuff? 18. Are there any extra charges at the Salvadoran Int’l airport before coming back home? 19. Do I need a visa to enter El Salvador? 20. How do I book a package? Direct flights to El Salvador are available from many of the major cities of the United States such as Los Angeles, San Francisco, Dallas, Atlanta, Boston, New York, Washington D.C. and Miami through TACA, American Airlines, Continental, United and Delta also have daily flights from its major Hubs. Contact us for more information. El Salvador’s reputation turned bad due to its civil war that ended 15 years ago when peace was signed. Nowadays the country has regenerated completely especially in the places that you’ll visit and surf. You can visit your doctor before traveling to El Salvador if you want, but there are no special vaccines required. You can check the CDC website and realize they are way too paranoid, we rarely see any considerate health related issues. We will arrange transportation for you regardless the time of arrival. All packages include sleeping accommodations and breakfast, depending on which you choose. Lunch and dinner are optional. Equipment rental is not included. Shopping and entertainment costs are not included. For most of the trip, you will only need board shorts, rash guards and casual clothing for hot weather. The temperature here oscillates between 75-105°F. The typical meal is rice and/or beans with pork, chicken, fish, beef or even any kind of seafood. You will also find Mc Donalds, Domino´s Pizza, Pizza Hut, KFC, BK, etc. Not in this lifetime! We are blessed with warm water the whole year; you may want to bring a rashguard for UV protection and prevention of jellyfish stings. The best period to learn how to surf is from October through February. $300 for a week should be enough to reach any other need not contemplated in our packages. Each of our groups is provided with a cell phone available 24/7, with 50 minutes to call to the US and Canada. You will also be available to receive unlimited incoming calls from anywhere in the world for free. Once your 50 minutes are out you can recharge your cell phone with prepaid calling cards available in most gas stations. 2. Lunch and dinner in El Salvador. Plan another US $ 20 per day/person for these meals (not including excessive drinking). 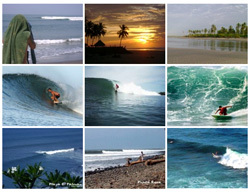 We are connected with surfboards rental places and national shapers with very low prices. Rent fees vary from $10 to $20 per day. Not that we know of. There hasn´t been a shark attack in the history of surfing in El Salvador. The pacific coasts are safer because of water temperature and conditions that sharks are not fond of. Yes, many of our accommodations have kitchens well equipped. But you can eat in many cheap (and good) restaurants around. A regular meal costs around US$ 7. Yes and no... More and more shops and establishments in La Libertad and the east side accept credit card payment, but it's not the majority. If any credit card is accepted, it's almost always VISA. You still can get cash at an ATM machine in the city which is at 40 minutes from La Libertad. Yes. A $32 fee is applicable for all passengers as TAX fee. Most of the airlines and travel agencies include this fee at the time of purchasing your ticket. Yes and no. If you are American, a “consular visa” is required. But you can get it upon your arrival at the airport and it’s for free, in other words, you don’t need to get into any hassle or make any paperwork before coming to El Salvador. If you are from Canada, Mexico, Belize, Taiwan, Singapore, Croatia, Salomon Island, Leetonia, Madagascar, Rumania, Barbuda, Bahamas, Barbados, Brazil, Brunei, Bulgaria, South Korea, Marshall Islands, Kuwait, Macedonia, Santa Lucia or Vanuatu you also need a "consular visa” and you can get it at the airport for $10. You usually get a 90-day period permit to stay in the country.